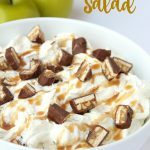 Snickers Caramel Apple Salad – a creamy, dreamy salad made with Snickers candy bars, pudding and whipped topping! Yes, and that’s what you’re going for with this salad, people. The “normal” recipe calls for six standard- sized Snickers bars because at the store that’s how many come in a pack. I say add eight and keep the rest for those moments of weakness. I’ve been sharing lots of savory salads lately like this Avocado Salad and this Caprese Pasta Salad. 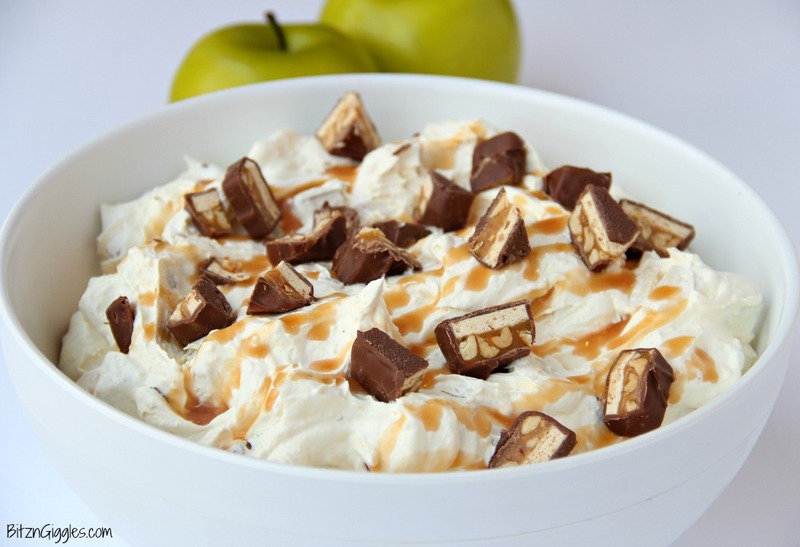 It was just time to share a sweet salad like this Snickers Caramel Apple Salad. For those of you who think it’s a good idea to add more apples vs. candy, I support you, but you’re not going to win the blue ribbon at the fair if you know what I’m saying. Here’s one more secret – use CREAMY Cool Whip instead of just the original. This adds an extra creamy, dreaminess to the salad that the original Cool Whip just doesn’t provide. If you’re trying to make this a healthy dish, just bring a fruit tray to the party. The fact that it has apples in it should be good enough. This is for special occasions and you don’t need a heaping pile to make you smile. That’s my disclaimer. You know how sometimes you see this salad looking more sticky than creamy? Whomever prepared it most likely used regular Cool Whip, and they probably mixed in the Cool Whip after they added the apples. Always prepare the Cool Whip mixture first, before you add any of the other ingredients. Truth. 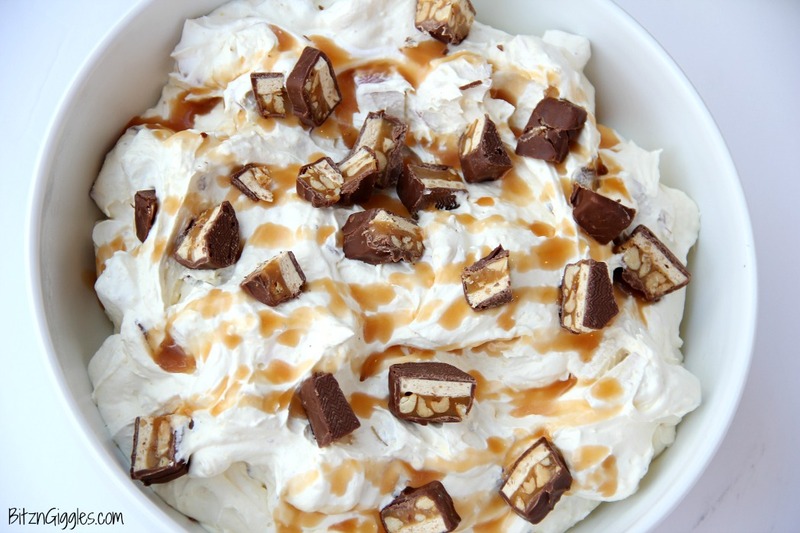 A creamy, dreamy salad made with Snickers candy bars, pudding and whipped topping! Chop up your apples and snickers bars. Some people say freezing them and then pounding them with a hammer works for them. For me, I cut each Snickers bar in half and then just cut horizontally into small pieces with a chef’s knife. Whisk pudding packet with milk and Cool Whip until combined. It’s helpful to also use a spatula to make sure you’re getting any dry pudding at the bottom of the bowl mixed in as well. Mix the chopped up apples and Snickers bars into the pudding mixture. Refrigerate for at least one hour. 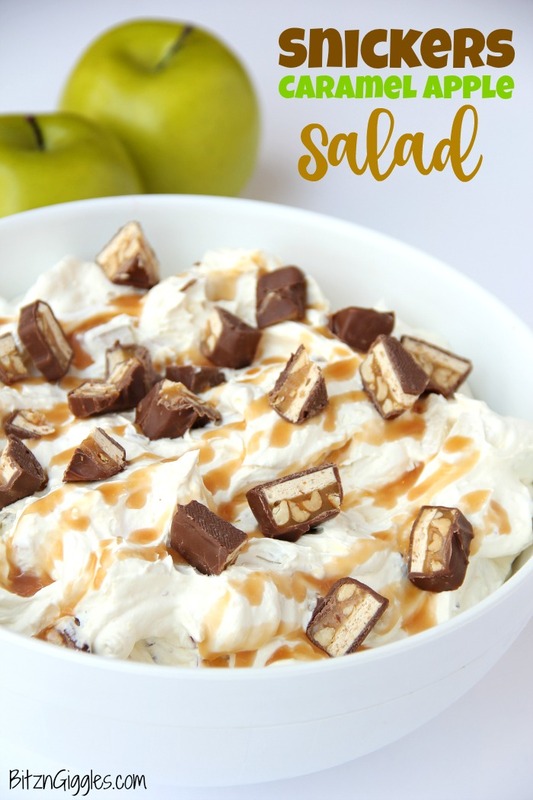 Before serving, sprinkle some extra chopped up Snickers on top of the salad (here’s where those extra candy bars come in handy) and drizzle with caramel for a decadent touch. Sara, I am so with you! The more Snickers the better 🙂 I love this salad and haven’t made it in ages. You have inspired me! Aww. . .Amy, thanks so much for your kind words. You definitely can’t go wrong with any recipe that contains Snickers bars! Enjoy the salad! So much yes. This looks SO darn good and will be so perfect for the next picnic/BBQ!! Love! Would cortland apples work for this recipe?? Hi Sara, I’m making the caramel apple salad for a ladies luncheon tomorrow, can I make this and it be good overnight? or will apples turn? Hi Revia, I’m sorry my reply is so late. I hope your luncheon went well. My recommendation would be to not to cut the apples too far ahead of time. Walmart does sell pre-sliced apples that will not brown so you could always go that route as well.